Dance! Dance has accompanied human since time immemorial. In the oldest iconographic artefacts this human activity is represented as mimicking a divine dancer. The possibility to express oneself through movement and the enchanting dynamics of a dance inspired many artists. They were choosing subjects from rich variations of the dance, drawing inspiration from not only the movement itself but also the meaning of the dance in the social context. Although the forms and ways of dancing significantly differ, what they have in common is a positive effect on the body and the soul. Gustáv Mallý painted young girls holding their hands in a circle dance. 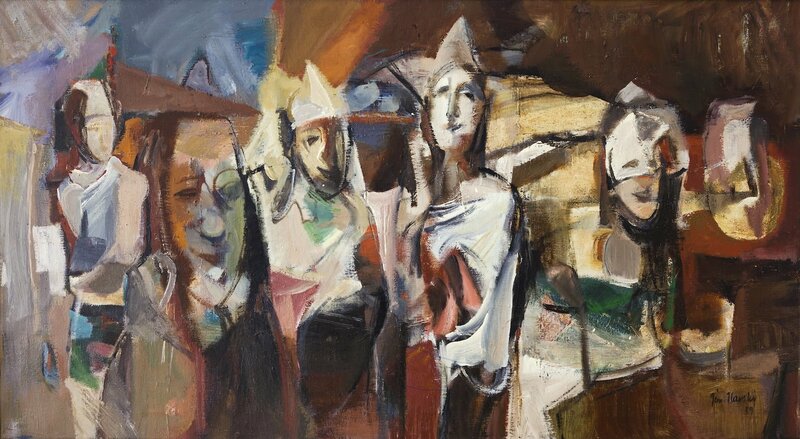 His painting is characterised by loose expressive brushwork. The joy and freedom are underlined by casual dress and the environment in which the scene is set. A green meadow turned into a dance floor and the mountains act as distant scenery. The painting by Jan Hála evokes a brisk tempo of a folk dance. 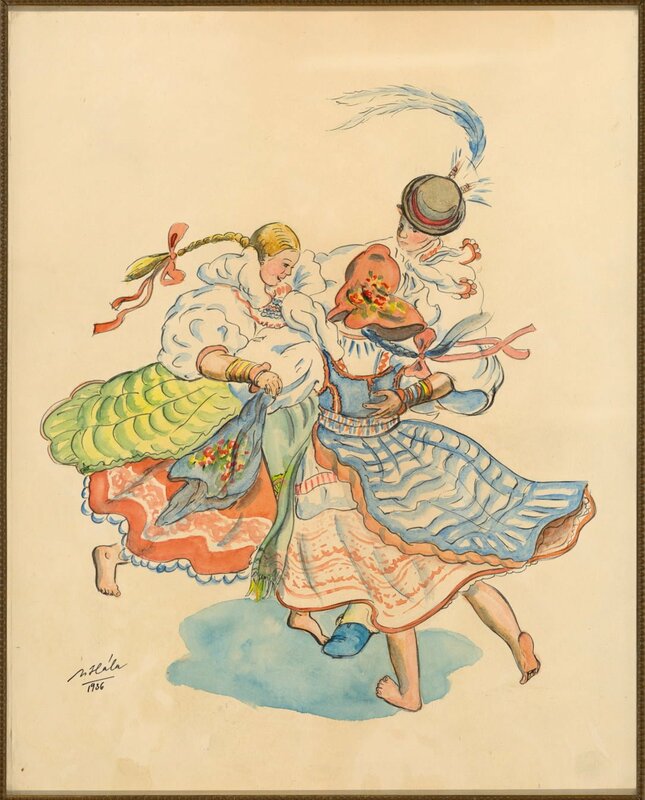 Three figures dressed in richly decorated folk costumes are twirling in the whirl of dance. A delicate ink drawing is supplemented with subtle, well-balanced colours that make the figures on an empty background look lively and decorative. 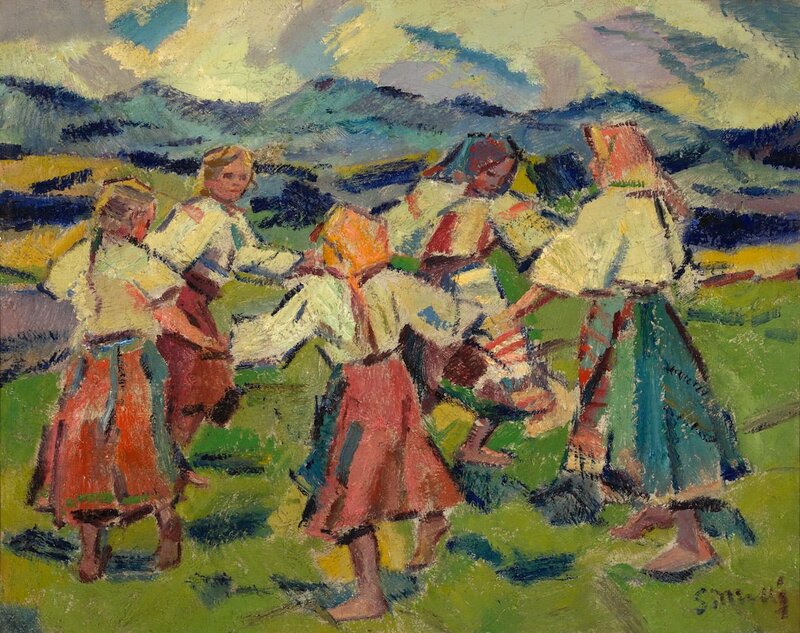 Cyprián Majerník´s dancers may look rough, yet equally spontaneous and cheerful. Compared to elegant, graceful formal dance, the can-can seems to be provocative and brazen. The painter depicted this sinful entertainment after his return from Paris where he could see this kind of dancing with his own eyes. The collection of selected works is supplemented with carnival scenes by Ján Ilavský and Rudolf Krivoš, as it hard to imagine the ball season or carnival without the dance. Works are presented at Gallery Cafe.